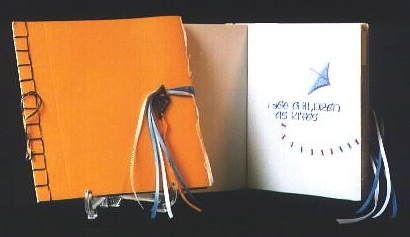 This 15-page stab bound book was written out by the artist in pointed pen uncial. Each of her 5 books for the exchange was original. The title is "Kites" by Erma Bombeck (about raising children). The first page shows a soaring kite, with the tail tied with bright handcolored rag ties swirling across the page & thereafter the kite tail is seen flowing thru the air intersecting the text on each successive page. The front closure is a handmade button in the form of a kite with tail attached. The writing was done with a Gillott 404 nib using WN Gouache on Strathmore drawing paper. For handcoloring Prismacolor pencils were used. The cover was Canson Mi Tientes.